Archaeologists from Jamestown have just discovered a 400 year old transcribed slate tablet from America's first English Settlement. The slate is covered with writings, numbers, and drawings of people, plants, and birds that its owner likely encountered in the New World in the early 1600s. The tablet was found a few feet down in what may be the first well at James Fort, dug in early 1609 by Capt. John Smith, Jamestown's best known leader, said Bill Kelso, director of archaeology at the site. 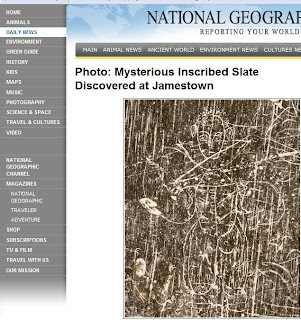 If the well is confirmed as Smith's, it could help offer important insights into Jamestown's difficult early years.